Last week, I received a special order for 2 dolls. 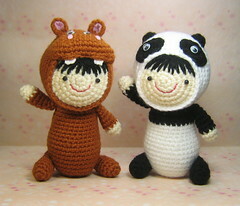 The doll in panda costume is easy for me to make because I just followed my pattern. The doll in hippo suit is something that's been on my list of things to do, and because of the request, I had to come up with a pattern. I hope the lady will like these dolls! After I took the photo, I had to pack them in a box...I didn't have the chance to enjoy looking at the dolls in person. A few days after I mailed these dolls, I found myself looking at their photos more and more in my computer :) I think I miss these dolls! But I ran out of stuffing and couldn't make any doll until I get new stuffing again. I also think I got lucky with the photo...usually it takes me several tries to find one that I like. This one took me only 3-4 tries. I will post more photos as soon as I make another as a model for my pattern. I will also make a "hippo friend" to go with the doll in hippo suit, just like my other dolls in costume patterns :) I am thinking of adding shoes to the pattern version of the doll in hippo suit, or just leave them like that, like babies in suits...perhaps I'd try one with shoes.